1986 D MERCEDES-BENZ SL 420SL R107 MODEL 4.2 V8 AUTO. GREAT CLASSIC INVESTMENT. 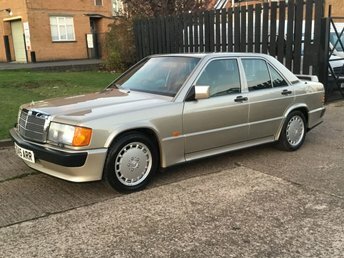 *** GREAT CLASSIC INVESTMENT *** VERY SOUGHT AFTER 420SL V8 R107 MODEL *** 1986 D-REGISTERED CLASSIC MERCEDES BENZ 420SL 4.2 V8 R107 SERIES MODEL AUTO. 168,147 MILES. HUGE SERVICE HISTORY FILE. Finished in metallic Thistle Green with the rare full black leather interior. Black mohair hood in excellent condition. Original alloys, Power steering, electric windows, CD Player, Fire extinguisher. Plus 2 seats in rear if need be. Last owner had for 4 years. Being a later Facelift car, it benefits from Galvanized panels, Switchable sports/economy gearbox, improved brakes and suspension and altogether more user friendly. Bodywork needs some TLC, hence the bargain price. PRIVATE PLATE NOT INCLUDED. These Mercedes are only going up in value one direction especially these V8 facelift models. PX WELCOME. FINANCE ARRANGED. ALL MAJOR DEBIT CREDIT CARDS ACCEPTED. DEPOSIT SECURES. PLEASE CALL : 01162 246530. PLEASE CALL : 07544 980372. With a superb range of used Mercedes-Benz cars for sale in Leicester to choose from, you should have no trouble finding a model to suit your lifestyle and budget. At Leicester Van Centre we're committed to delivering excellent customer service and will always go further to ensure our customers drive away with a smile. If you're in the market for a sporty hatch like the Mercedes-Benz A-Class or require an elegant and supremely well-equipped executive model such as the C-Class Saloon, our team is here to help. Take the opportunity to browse our complete stock of pre-owned Mercedes-Benz cars here on the website and be sure to speak to a member of the team if you have any questions or wish to arrange a test drive.